"The error prone barcode process was given a real update and RFID now enables 5 key processes for intralogistics offering SCA full warehouse visibility." SCA tissue factories produce tissue paper from pulp and then convert it into products like toilet or kitchen paper within the same factory. This means, that within the factory, there is a buffer stock of thousands of tambour reels which weigh 2,5 tons each. This buffer stock was not managed in a Warehouse Management System (WMS) thus, leading to warehouse level errors in the manual bookkeeping. The material consumption to the Manufacturing Execution System (MES) was based on error prone manual barcode processes. SCA’s target was to improve the material movement traceability and stock level accuracy of the in-house process. 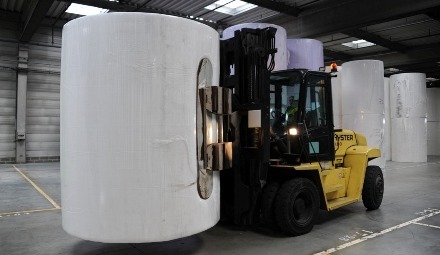 SCA, at its tissue factory in Le Theil, France, decided to introduce warehouse management into the tambour reel process and automate the warehouse transactions with RFID. SAP WMS was chosen as the WMS system and Vilant provided the RFID infrastructure. The system is based on UHF Gen2 RFID tags, which are integrated into reusable cardboard cores of tambour reels. The product and item codes are written into the RFID tag of the core at the paper machine. Warehouse movements are tracked with RFID enabled forklifts that both identify the tambour reel and the storage location from the floor tags. The conversion machines and cut points with RFID readers allocate both the consumption to certain production runs and track the consumption of a reel. All RFID transactions are integrated into SCA’s MES and SAP WMS. Annually 40 000 reels are processed in 5 process steps, thus 200 000 MES/WMS transactions were automated with RFID. No manual material movement processing to systems. Significantly increased data quality for material availability and consumption allocation. SCA is a leading global provider of sustainable personal care, tissue and forest products. Sales are conducted in about 100 countries under many strong brands, including the leading global brands TENA and Tork, and regional brands, such as Lotus, Libresse, Tempo and Libero. As Europe’s largest private forest owner, SCA places considerable emphasis on sustainable forest management. The Group has about 36,000 employees and sales in 2012 amounted to SEK 85bn (EUR 9.8bn). Contact us with this form. With more than 15 years of experience we are the ones to kick start your RFID project. Don’t hesitate to leave your contact details below for our experts to contact you for more information on our Solutions and Refences. You can also find the direct contact details of our Sales team here.